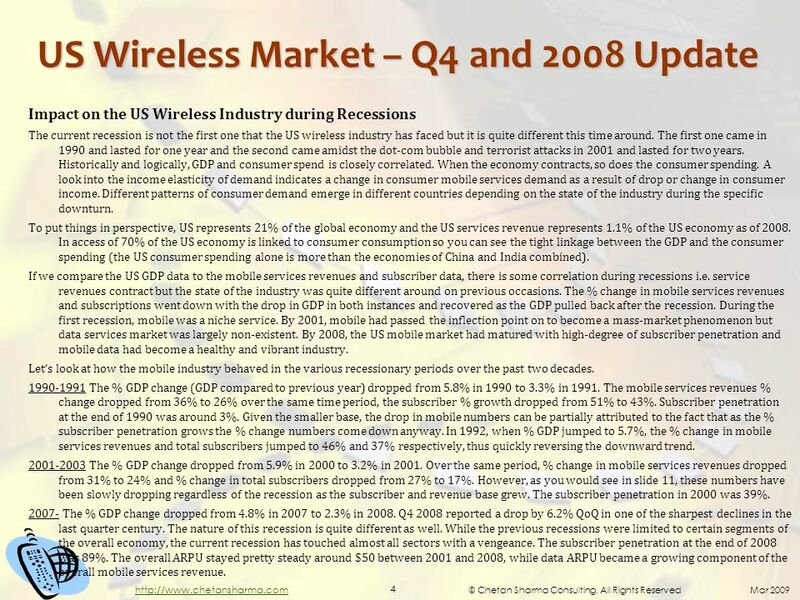 US Wireless Data Market Q4 2008 and 2008 Update. 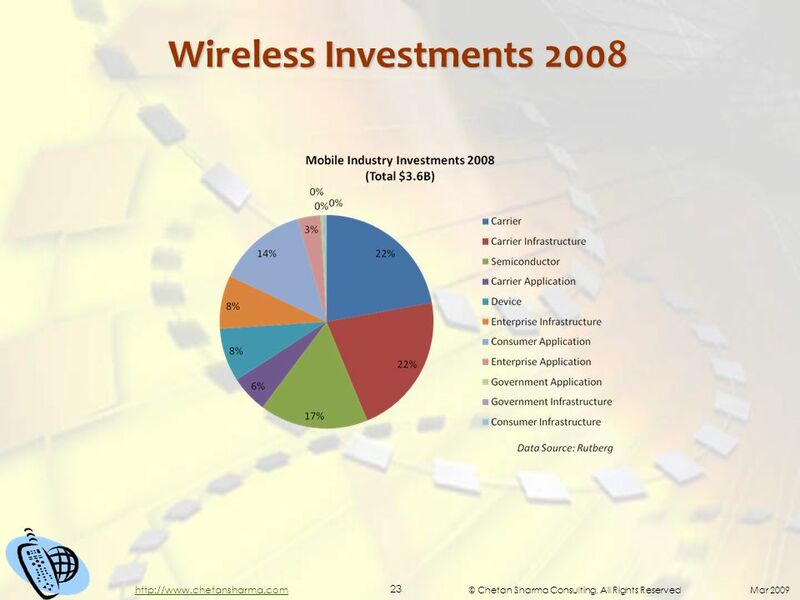 © Chetan Sharma Consulting, All Rights Reserved Mar 2009 2 US Wireless Market. 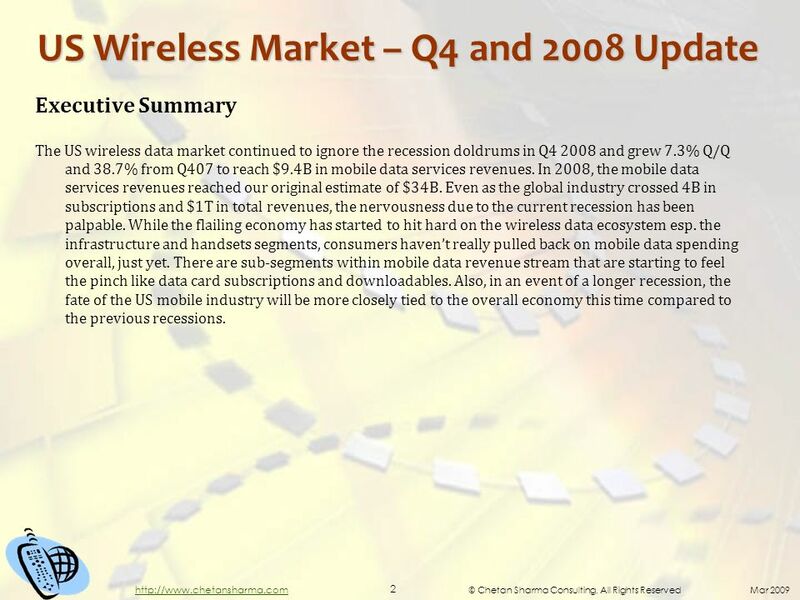 2 © Chetan Sharma Consulting, All Rights Reserved Mar 2009 2 http://www.chetansharma.com US Wireless Market – Q4 and 2008 Update Executive Summary The US wireless data market continued to ignore the recession doldrums in Q4 2008 and grew 7.3% Q/Q and 38.7% from Q407 to reach $9.4B in mobile data services revenues. In 2008, the mobile data services revenues reached our original estimate of $34B. Even as the global industry crossed 4B in subscriptions and $1T in total revenues, the nervousness due to the current recession has been palpable. While the flailing economy has started to hit hard on the wireless data ecosystem esp. the infrastructure and handsets segments, consumers havent really pulled back on mobile data spending overall, just yet. There are sub-segments within mobile data revenue stream that are starting to feel the pinch like data card subscriptions and downloadables. Also, in an event of a longer recession, the fate of the US mobile industry will be more closely tied to the overall economy this time compared to the previous recessions. 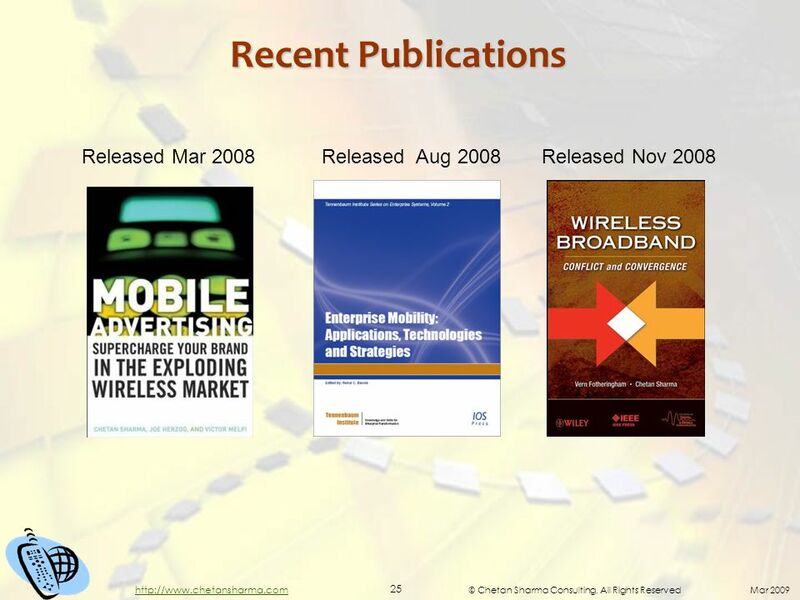 3 © Chetan Sharma Consulting, All Rights Reserved Mar 2009 3 http://www.chetansharma.com US Wireless Market – Q4 and 2008 Update US Wireless Industry in Recession - A collision of two perfect storms Back in 2005, we published a paper titled 3G - Hitting the Mass Market in which we presented the case for an explosive market growth in the US market riding on the back of 3G and posited that by 2009, US will become the leading nation in terms of the number of 3G subscribers. As of 2008, US crossed 100M 3G subscribers catapulting ahead of all industrialized nations in terms of total subscribers (% penetration was around 40%). The paper was based on our work in various markets and study of diffusion trends in the global markets. That study became the subject of several articles and cover stories and was one of the central documents (including our testimony in the case and a report to the President) referred to in one of the most prominent wireless industry cases in front of the US International Trade Commission. 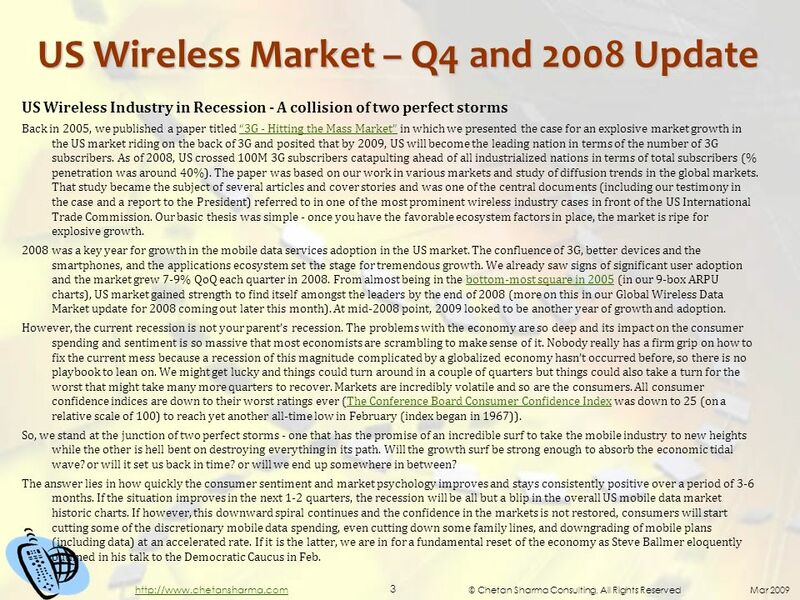 Our basic thesis was simple - once you have the favorable ecosystem factors in place, the market is ripe for explosive growth.3G - Hitting the Mass Market 2008 was a key year for growth in the mobile data services adoption in the US market. The confluence of 3G, better devices and the smartphones, and the applications ecosystem set the stage for tremendous growth. We already saw signs of significant user adoption and the market grew 7-9% QoQ each quarter in 2008. 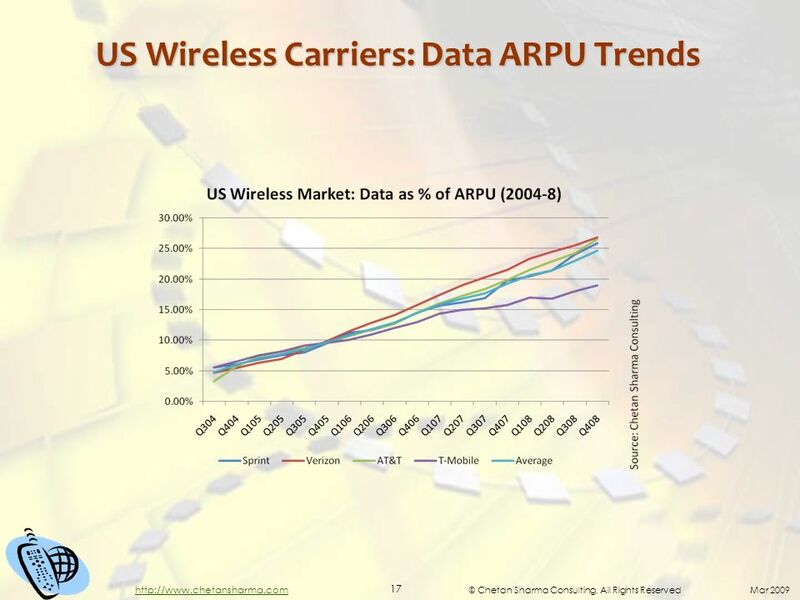 From almost being in the bottom-most square in 2005 (in our 9-box ARPU charts), US market gained strength to find itself amongst the leaders by the end of 2008 (more on this in our Global Wireless Data Market update for 2008 coming out later this month). At mid-2008 point, 2009 looked to be another year of growth and adoption.bottom-most square in 2005 However, the current recession is not your parents recession. The problems with the economy are so deep and its impact on the consumer spending and sentiment is so massive that most economists are scrambling to make sense of it. Nobody really has a firm grip on how to fix the current mess because a recession of this magnitude complicated by a globalized economy hasnt occurred before, so there is no playbook to lean on. We might get lucky and things could turn around in a couple of quarters but things could also take a turn for the worst that might take many more quarters to recover. Markets are incredibly volatile and so are the consumers. All consumer confidence indices are down to their worst ratings ever (The Conference Board Consumer Confidence Index was down to 25 (on a relative scale of 100) to reach yet another all-time low in February (index began in 1967)).The Conference Board Consumer Confidence Index So, we stand at the junction of two perfect storms - one that has the promise of an incredible surf to take the mobile industry to new heights while the other is hell bent on destroying everything in its path. Will the growth surf be strong enough to absorb the economic tidal wave? or will it set us back in time? or will we end up somewhere in between? The answer lies in how quickly the consumer sentiment and market psychology improves and stays consistently positive over a period of 3-6 months. If the situation improves in the next 1-2 quarters, the recession will be all but a blip in the overall US mobile data market historic charts. If however, this downward spiral continues and the confidence in the markets is not restored, consumers will start cutting some of the discretionary mobile data spending, even cutting down some family lines, and downgrading of mobile plans (including data) at an accelerated rate. If it is the latter, we are in for a fundamental reset of the economy as Steve Ballmer eloquently outlined in his talk to the Democratic Caucus in Feb.
4 © Chetan Sharma Consulting, All Rights Reserved Mar 2009 4 http://www.chetansharma.com US Wireless Market – Q4 and 2008 Update Impact on the US Wireless Industry during Recessions The current recession is not the first one that the US wireless industry has faced but it is quite different this time around. The first one came in 1990 and lasted for one year and the second came amidst the dot-com bubble and terrorist attacks in 2001 and lasted for two years. Historically and logically, GDP and consumer spend is closely correlated. When the economy contracts, so does the consumer spending. A look into the income elasticity of demand indicates a change in consumer mobile services demand as a result of drop or change in consumer income. Different patterns of consumer demand emerge in different countries depending on the state of the industry during the specific downturn. To put things in perspective, US represents 21% of the global economy and the US services revenue represents 1.1% of the US economy as of 2008. In access of 70% of the US economy is linked to consumer consumption so you can see the tight linkage between the GDP and the consumer spending (the US consumer spending alone is more than the economies of China and India combined). If we compare the US GDP data to the mobile services revenues and subscriber data, there is some correlation during recessions i.e. service revenues contract but the state of the industry was quite different around on previous occasions. The % change in mobile services revenues and subscriptions went down with the drop in GDP in both instances and recovered as the GDP pulled back after the recession. During the first recession, mobile was a niche service. By 2001, mobile had passed the inflection point on to become a mass-market phenomenon but data services market was largely non-existent. By 2008, the US mobile market had matured with high-degree of subscriber penetration and mobile data had become a healthy and vibrant industry. Lets look at how the mobile industry behaved in the various recessionary periods over the past two decades. 1990-1991 The % GDP change (GDP compared to previous year) dropped from 5.8% in 1990 to 3.3% in 1991. The mobile services revenues % change dropped from 36% to 26% over the same time period, the subscriber % growth dropped from 51% to 43%. Subscriber penetration at the end of 1990 was around 3%. Given the smaller base, the drop in mobile numbers can be partially attributed to the fact that as the % subscriber penetration grows the % change numbers come down anyway. In 1992, when % GDP jumped to 5.7%, the % change in mobile services revenues and total subscribers jumped to 46% and 37% respectively, thus quickly reversing the downward trend. 2001-2003 The % GDP change dropped from 5.9% in 2000 to 3.2% in 2001. Over the same period, % change in mobile services revenues dropped from 31% to 24% and % change in total subscribers dropped from 27% to 17%. However, as you would see in slide 11, these numbers have been slowly dropping regardless of the recession as the subscriber and revenue base grew. The subscriber penetration in 2000 was 39%. 2007- The % GDP change dropped from 4.8% in 2007 to 2.3% in 2008. Q4 2008 reported a drop by 6.2% QoQ in one of the sharpest declines in the last quarter century. The nature of this recession is quite different as well. While the previous recessions were limited to certain segments of the overall economy, the current recession has touched almost all sectors with a vengeance. The subscriber penetration at the end of 2008 was 89%. 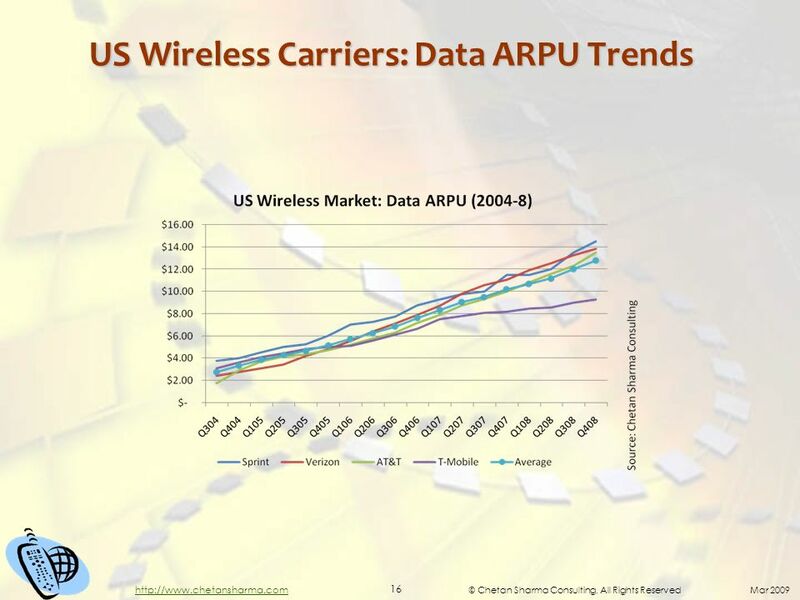 The overall ARPU stayed pretty steady around $50 between 2001 and 2008, while data ARPU became a growing component of the overall mobile services revenue. 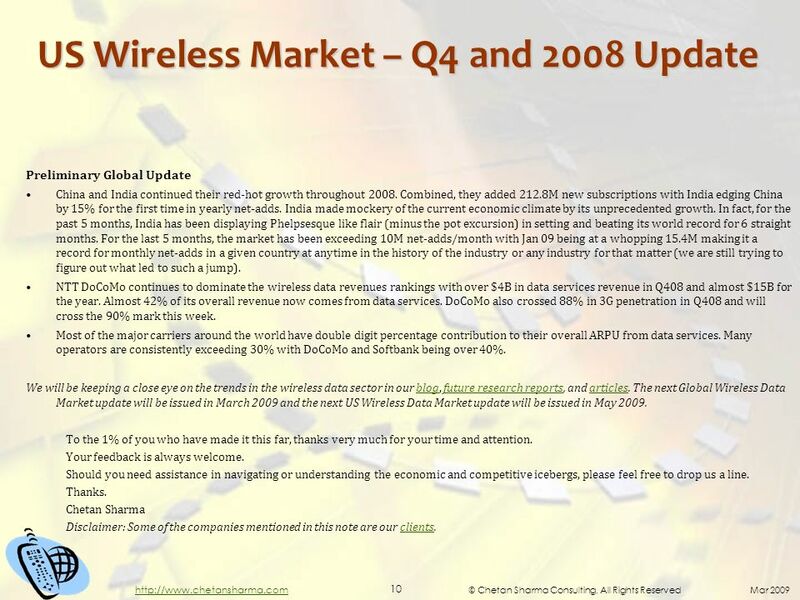 5 © Chetan Sharma Consulting, All Rights Reserved Mar 2009 5 http://www.chetansharma.com US Wireless Market – Q4 and 2008 Update What to expect in the coming months? 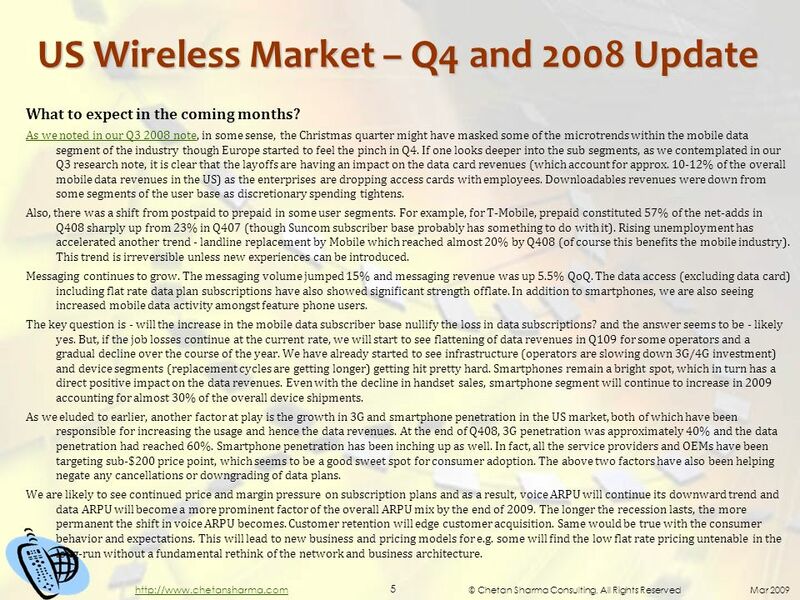 As we noted in our Q3 2008 noteAs we noted in our Q3 2008 note, in some sense, the Christmas quarter might have masked some of the microtrends within the mobile data segment of the industry though Europe started to feel the pinch in Q4. If one looks deeper into the sub segments, as we contemplated in our Q3 research note, it is clear that the layoffs are having an impact on the data card revenues (which account for approx. 10-12% of the overall mobile data revenues in the US) as the enterprises are dropping access cards with employees. Downloadables revenues were down from some segments of the user base as discretionary spending tightens. Also, there was a shift from postpaid to prepaid in some user segments. For example, for T-Mobile, prepaid constituted 57% of the net-adds in Q408 sharply up from 23% in Q407 (though Suncom subscriber base probably has something to do with it). Rising unemployment has accelerated another trend - landline replacement by Mobile which reached almost 20% by Q408 (of course this benefits the mobile industry). This trend is irreversible unless new experiences can be introduced. Messaging continues to grow. The messaging volume jumped 15% and messaging revenue was up 5.5% QoQ. The data access (excluding data card) including flat rate data plan subscriptions have also showed significant strength offlate. In addition to smartphones, we are also seeing increased mobile data activity amongst feature phone users. The key question is - will the increase in the mobile data subscriber base nullify the loss in data subscriptions? and the answer seems to be - likely yes. But, if the job losses continue at the current rate, we will start to see flattening of data revenues in Q109 for some operators and a gradual decline over the course of the year. We have already started to see infrastructure (operators are slowing down 3G/4G investment) and device segments (replacement cycles are getting longer) getting hit pretty hard. Smartphones remain a bright spot, which in turn has a direct positive impact on the data revenues. Even with the decline in handset sales, smartphone segment will continue to increase in 2009 accounting for almost 30% of the overall device shipments. As we eluded to earlier, another factor at play is the growth in 3G and smartphone penetration in the US market, both of which have been responsible for increasing the usage and hence the data revenues. At the end of Q408, 3G penetration was approximately 40% and the data penetration had reached 60%. Smartphone penetration has been inching up as well. In fact, all the service providers and OEMs have been targeting sub-$200 price point, which seems to be a good sweet spot for consumer adoption. The above two factors have also been helping negate any cancellations or downgrading of data plans. We are likely to see continued price and margin pressure on subscription plans and as a result, voice ARPU will continue its downward trend and data ARPU will become a more prominent factor of the overall ARPU mix by the end of 2009. The longer the recession lasts, the more permanent the shift in voice ARPU becomes. Customer retention will edge customer acquisition. Same would be true with the consumer behavior and expectations. This will lead to new business and pricing models for e.g. some will find the low flat rate pricing untenable in the long-run without a fundamental rethink of the network and business architecture. 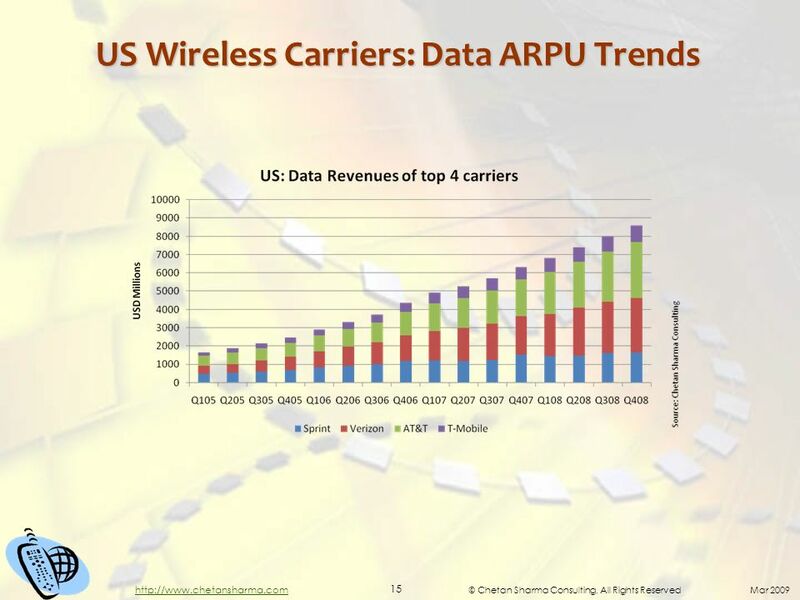 6 © Chetan Sharma Consulting, All Rights Reserved Mar 2009 6 http://www.chetansharma.com US Wireless Market – Q4 and 2008 Update The percentage contribution to the overall ARPU from data reached almost 25% in 2008 and is likely to exceed 30% by the end of 2009. For the first time since 1998, the voice ARPU dip below $40 in the US. During the last downturn, the likes of Google emerged. These players didnt have much to do with the mobile market at the time but have gradually put their indelible stamp on the future of the industry. It is almost certain that new media and telecom models will emerge as a result of the current crises with new players shaping the next decade of the mobile industry. Whether this recession invites regulatory intervention remains to be seen. Government can encourage mobile adoption by reducing taxes and fees on mobile services, avoiding unnecessary regulations, making more spectrum readily available, increasing competition, investing and incentivizing in mobile broadband. Also, will the industry price or innovate its way out of this recession? The short-term knee-jerk reaction is to generally lean on price- differentiation but innovative services and business models can lay the ground work for a more sustainable differentiation and long-term benefits from new services adoption. Coming back to the 2008 forecasts, our estimate of the mobile data revenues was spot on. The annual mobile data services revenue stood at $34B. We will be keeping a very close eye on the micro- and macro-trends and reporting on the market on a regular basis in various private and public settings. 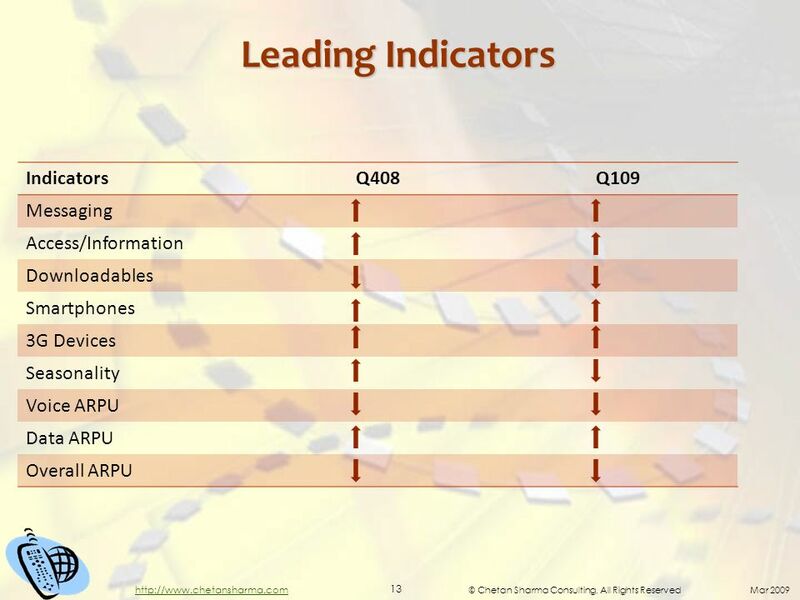 Q109 numbers will give us a better insight into the impact of the current recession on the US mobile industry and the global markets at large. The bottom line is that in an event of a long and deep recession (i.e. beyond 2009), which I am afraid seems to be the case, the fate of the US mobile industry will be more closely tied to the overall economy this time compared to the previous recessions. If the consumer and market sentiment improves within the next 3-6 months, the mobile data industry will continue its rapid growth. Despite a difficult environment, we expect the mobile data services revenues to grow by at least 15% YOY in 2009. 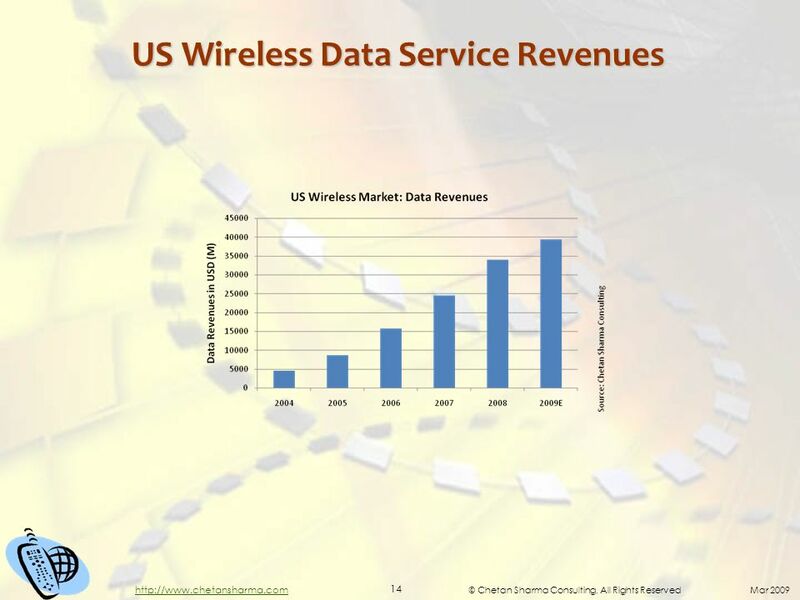 7 © Chetan Sharma Consulting, All Rights Reserved Mar 2009 7 http://www.chetansharma.com US Wireless Market – Q4 and 2008 Update Against this backdrop, the analysis of the Q408 and 2008 US wireless data market is: Service Revenues The US Wireless data service revenues grew 7.3% Q/Q to $9.4B in Q408. Compared to Q407, the data service revenues grew 38.7%. AT&Ts data revenues grew the most - 12% QoQ and 52% YoY. Verizon experienced a 42% lift and T-Mobile saw a 30% increase in YoY data revenue growth. As expected, both AT&T and Verizon became two of the four operators to exceed $10B in data revenues for the year for the first time by (global) operators besides NTT DoCoMo (China Mobile is the other carrier to join the club). AT&T surpassed Verizon in data revenues for the first time since 2005 though for the year Verizon still ended up being ahead for the third straight year. AT&T and Verizon now account for 62.5% of the market data services revenues. Sprint had a third consecutive quarter of data revenue growth after falling behind its peers for the past couple of years. The average industry percentage contribution of data to overall ARPU reached 25%. In 2007, the percentage contribution stood at approximately 19.3%. US market is likely to exceed the 30% mark in 2009. 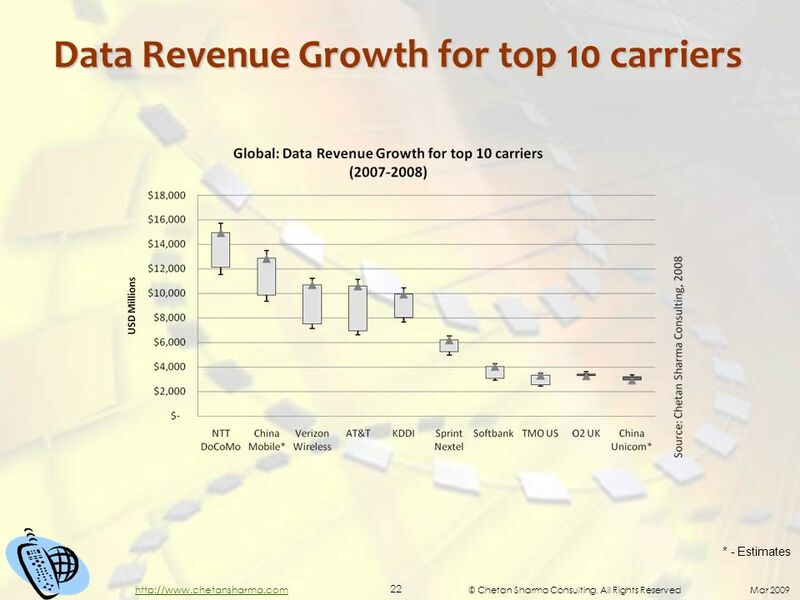 T-Mobile USA edged past O2 UK to secure the 8th spot in the top 10 rankings of global mobile operators by data revenues. For the year, Verizon and AT&T improved their rankings to #3 and #4 respectively at the expense of KDDI which dropped to #5. Sprint Nextel maintained its # 6 spot. AT&T and Verizon are in the select group of four global operators who are now generating almost $3B or more in data revenues/quarter (the other two are NTT DoCoMo and China Mobile). ARPU Overall ARPU decreased by $0.36. 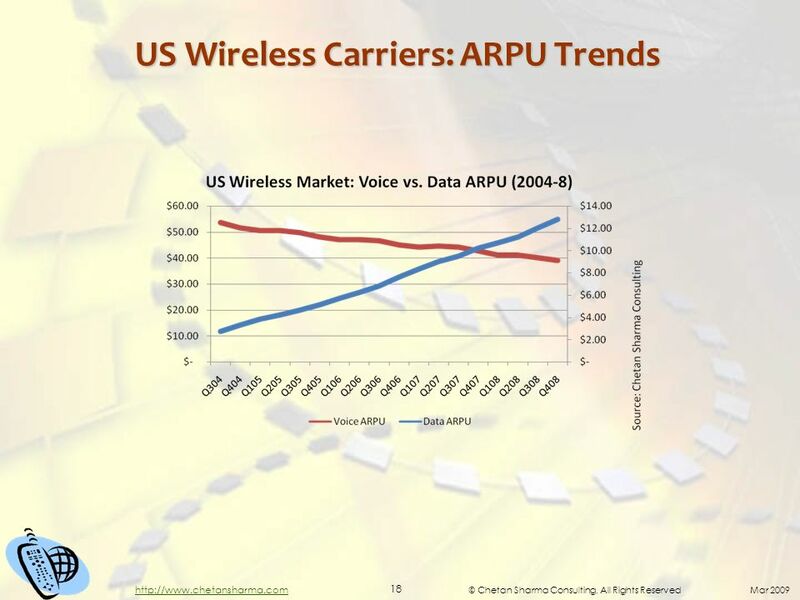 Average voice ARPU declined by $1.13 while average data ARPU grew by $0.77 or 6% but couldnt negate the drop in voice ARPU. AT&T led in postpaid data ARPU at $16.30 (or 27.35% of the revenues) followed by Sprint at $14.50 (or 25.89%). 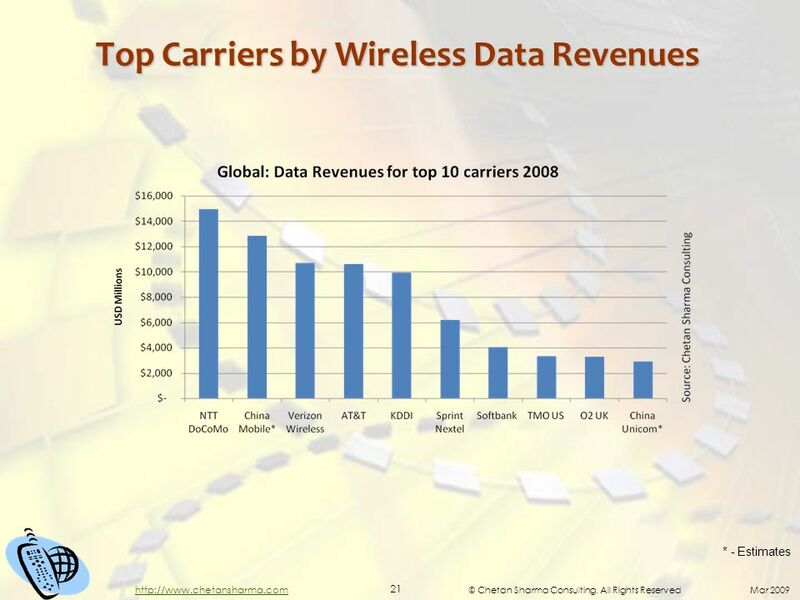 9 © Chetan Sharma Consulting, All Rights Reserved Mar 2009 9 http://www.chetansharma.com US Wireless Market – Q4 and 2008 Update As we had mentioned back in July, Apple easily surpassed its 10M target in Q308 buoyed by its 100 country expansion plan. The broadband and appstore capabilities are quite attractive to consumers and it shows. VPN and direct access to Exchange is helping in getting many more users into the mix and making IT folks less apprehensive. The clearcut business model of 30/70 split is also attractive. While there is no dearth of applications, findability remains a challenge.As we had mentioned back in July Apples success is inspiring carriers and OEMs to launch similar app-stores. Many operators launched an upgraded version of their existing Appstore offerings (and so did Google and RIM, even Microsoft and Nokia) along the lines of Apples initiative with promises of greater control to the application developers. However, many of such initiatives will fall flat due to weak developer ecosystems. Handsets Nokia eclipsed 100M unit sale in Q408 for the seventh straight quarter. It sold over 113M handsets in the quarter, more than the next three players combined. Nokias global market share stood at 38.6%. Samsung surged to 52.8M in handset sales for the quarter. For the year, the industry again eclipsed the 1 billion handset mark for 2008 and had a modest growth of 3.5% but the overall handset sales are likely to decline by 10-15% in 2009 (though still exceeding 1B). The growth in smartphone usage is also putting pressure on the networks which are not able to handle the load during peak times in certain cities thus forcing carriers to look for alternate strategies to satisfy the demand for broadband - metered billing, UMA, Femtocells, Hotspot buys, WiMAX, LTE, and others. We deal with the whole topic of Wireless Broadband in great detail in our recently released book Wireless Broadband - Conflict and Convergence (IEEE Press/John Wiley). We will have more to say on the subject in the coming days and months.Wireless Broadband - Conflict and Convergence Q4 also saw the launch of the fabled G-phone as G1 Google phone launched by T-Mobile in the US market and it is slowly making its way into Europe. While G1 is no iPhone, it introduced long-awaited features such as multiple processes, more open APIs, and others. Motorola, HTC, and others are said to be planning to launch more Android devices in 2009. The smartphone segment has clearly shaken up the market with Apple, Google, RIM, and Nokia being the main competitors. Microsoft appears to be waking up from its slumber and is rethinking its mobile strategy starting with an easy button. Misc. Not surprisingly, Venture money in the mobile sector experienced a rapid decline. Compared to Q407, venture financing declined by 36%, and the yearly totals are 26% lower than what they were a year ago. (Source: Rutberg) While WiMAX was launched with great fanfare with several key players participating in the investment pool, its long term prospects look uncertain as the delays in getting a nationwide network by a major operator in a major economy threatens the underpinnings of this nascent industry segment. To be relevant, the WiMAX fraternity needs to figure out some solutions in a hurry. In a sign of convergence battles to come, T-Mobiles @Home and various Femto cell initiatives started to take hold. Cable operators are also aggressively seeking triple-play by providing the wireless component of the service. Dont be surprised by some acquisitions in 2009. 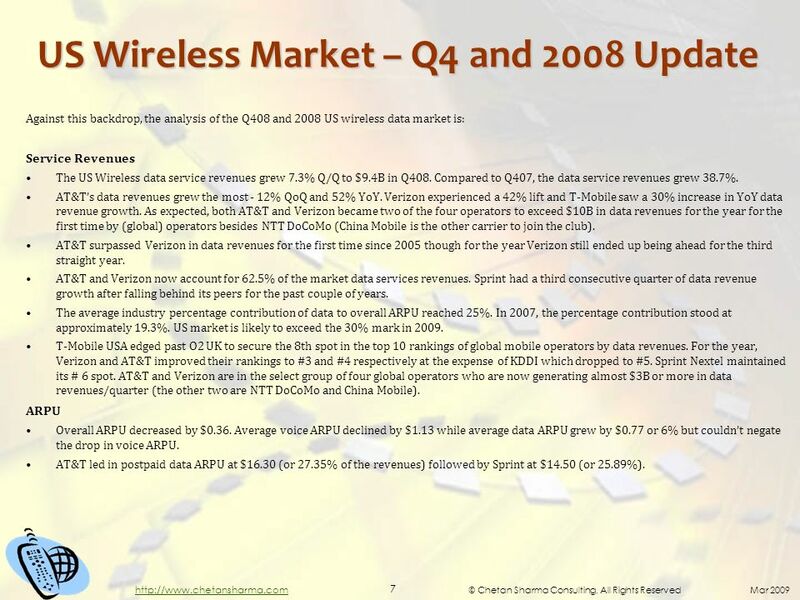 Download ppt "US Wireless Data Market Q4 2008 and 2008 Update. 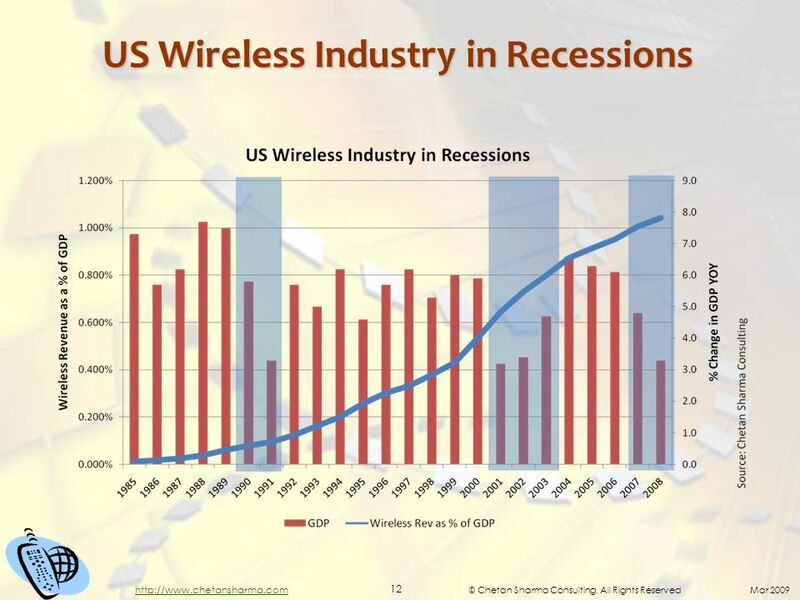 © Chetan Sharma Consulting, All Rights Reserved Mar 2009 2 US Wireless Market." 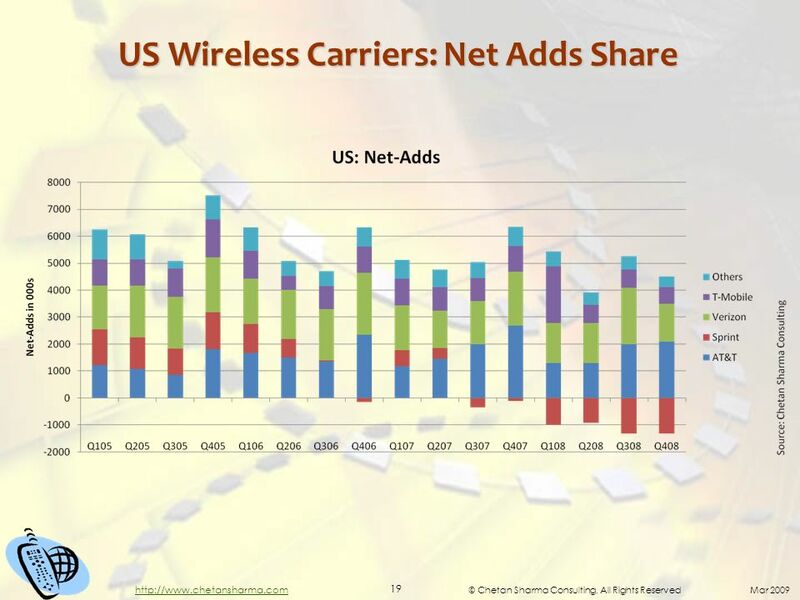 US Wireless Data Market Q Update. 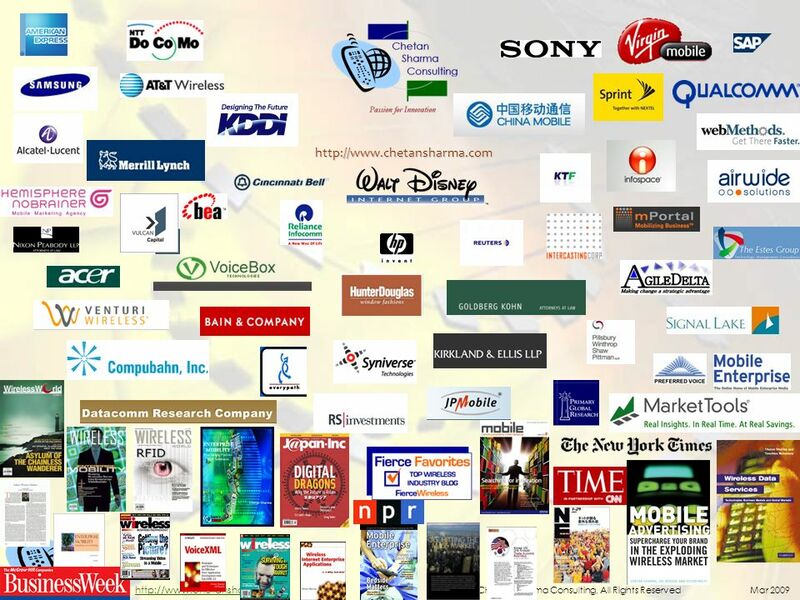 © Chetan Sharma Consulting, All Rights Reserved Nov US Wireless Market – Q3. 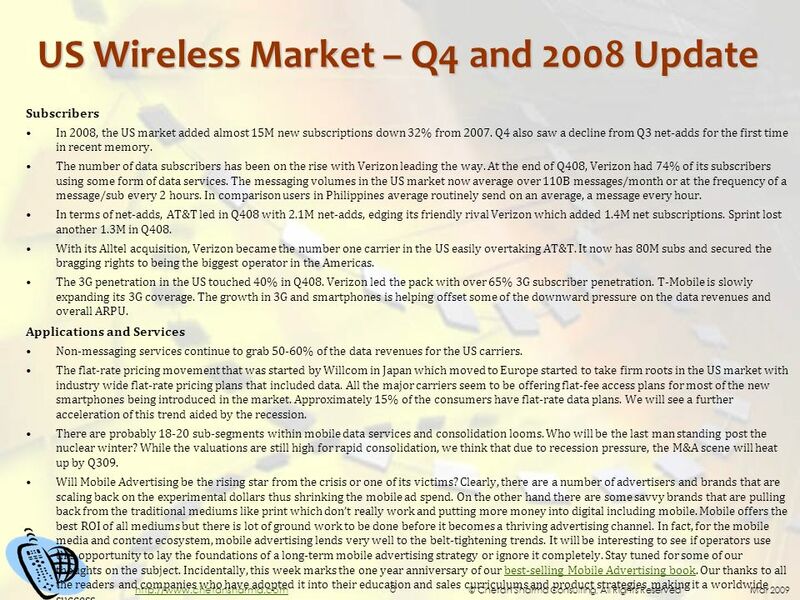 US Wireless Market 3Q 2006 Update. 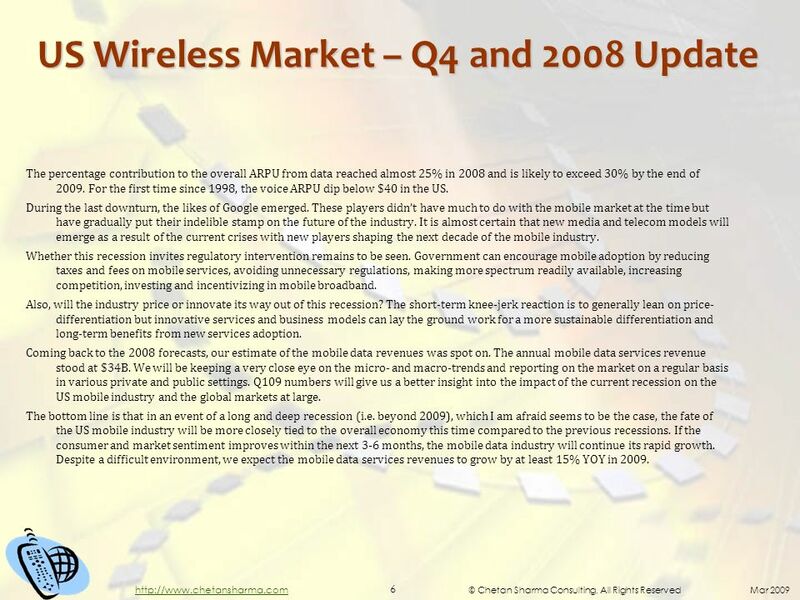 © Chetan Sharma Consulting, All Rights Reserved Nov US Wireless Market – 3Q06 Update. US Wireless Market Mid Year Update. 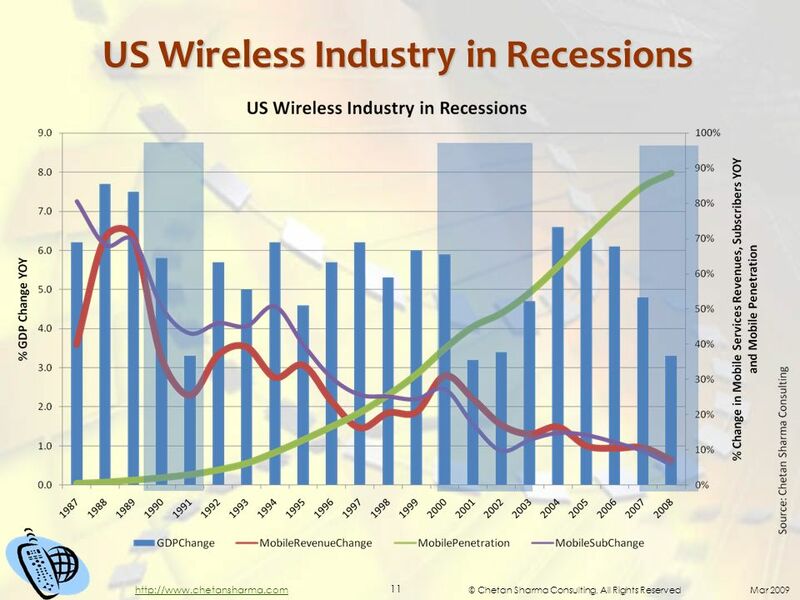 © Chetan Sharma Consulting, Aug US Wireless Market – Mid Year Update US wireless. 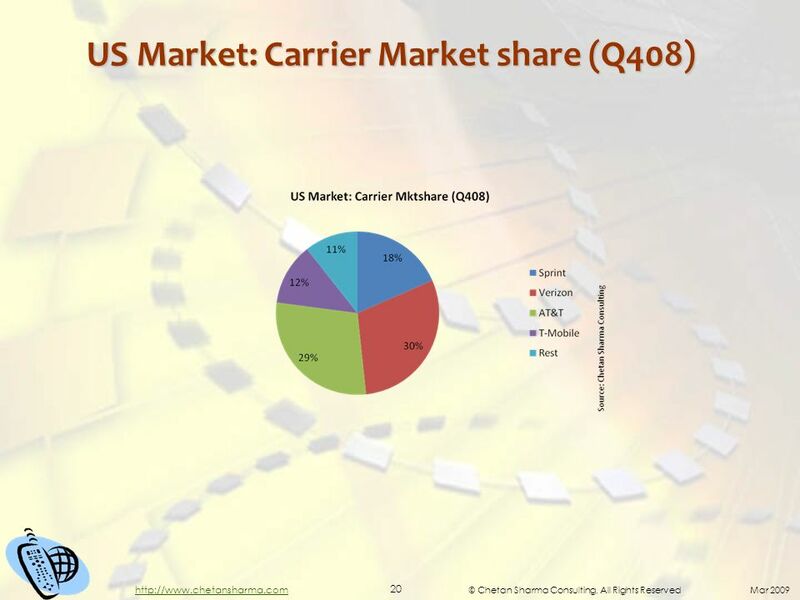 US Wireless Data Market Q Update. © Chetan Sharma Consulting, All Rights Reserved May US Wireless Market – Q1. McGraw-Hill/Irwin © 2004 The McGraw-Hill Companies, Inc., All Rights Reserved. Aggregate Demand, Aggregate Supply, and Modern Macroeconomics Chapter 9. 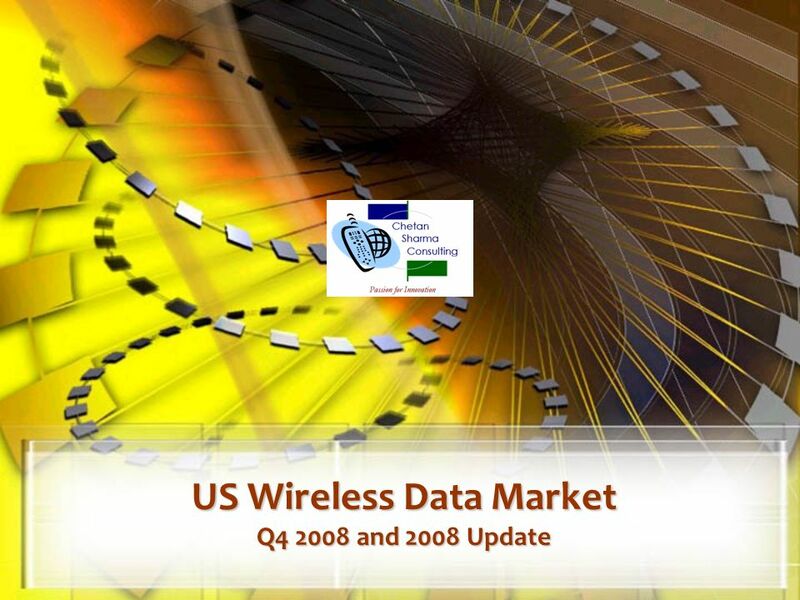 US Wireless Data Market Q3 2008 Update. 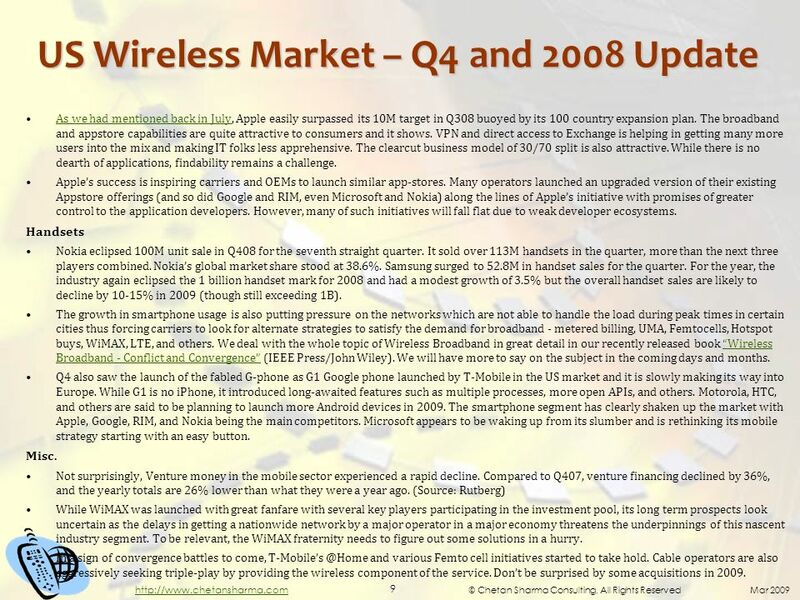 © Chetan Sharma Consulting, All Rights Reserved Nov 2008 2 US Wireless Market – Q3.